In the weeks following, I attended two ecumenical evenings, of quite different character. The first was with an informal network that has been meeting for decades, the Jerusalem Ecumenical Friends Network (or some variation thereof). Moderated by a kindly White Father (Missionaries of Africa), about 25 of us gathered in the Austrian Hospice (founded 1863) including representatives of the Anglican, Armenian Apostolic, Baptist, Greek Orthodox, Lutheran, and Catholics of Latin, Melkite, and Maronite churches. Focolare and Chemin Neuf were both present. Others are often represented, often including Churches with little or no official dialogue. A pleasant evening and a great way to connect with some of the local ecumenists. From Tantur, the rector, librarian, and myself were present. Simpler in nature, this was the real ecumenists’ meeting; the second was more grand, though a little less on-topic for Christian Unity. The opportunity no less appreciated for that, however. Having been to the Cathedral of Notre Dame in Paris on my way to the University of Notre Dame, this makes the third Notre Dame I had been to in little more than a week’s time. The installation liturgy was accompanied by an impressive Polish choir and included clergy representatives from the Latin and Melkite Catholics, the Armenian Apostolic Church, the Greek Orthodox, the Coptic and Syriac Oriental Orthodox, Anglican, Lutheran, and the United Protestant Church of France. Arab Catholic scouts were present as servers and standard bearers. In a bit of interesting trivia, I only just discovered that the Centre is actually a Territorial Prelature, giving it quasi-diocesan status, distinct from the Latin Patriarchate, with the Apostolic Delegate as Ordinary. Originally built as a pilgrim house for the French by the Assumptionists in 1904, the Yom Kippur War left it in a state of disrepair. It was given over the Holy See in 1972, and Pope John Paul II established it as a territorial prelature barely two months into his papacy. In late November 2004, just four months before his death, a motu proprio was issued giving control of the Centre to the scandalously problematic Legion of Christ. Given the pope’s known health issues at the time as well as the already well known problems in the Legion, this move was, shall we say, controversial. The occasion this time was an elaborate ceremony and dinner celebrating the installation of a new Grand Master of the Order of St. Lazarus* and the initiation of several new members from around Europe and the Mediterranean, including an Orthodox colleague I have met here. Prior to this event, all I knew of the Order was that they had some connection to, or inspiration from, the crusader-Hospitaller order of the same name, and their intentional ecumenical inclusion of members, and their support of a keynote at the National Workshop in Christian Unity in the U.S. It is this ecumenical inclusion – if not explicit goal of Christian Unity – that makes this Order more appealing to some ecumenists than some of the more widely known charitable Orders – such as the Sovereign Military Order of Malta, or the Equestrian Order of the Holy Sepulchre. (I am coming to think of all of these organizations as elaborate donor recognition societies, or as the Knights of Columbus on steroids. Which is no bad thing, in itself). I was impressed with the conversations I had, with both officers and guests, including delightful dinner conversation with the local Finnish Lutheran pastor and her daughter, though we shared the experience as sort of outsiders – coming from cultures where the medieval concepts of royalty and nobility have been excised. Many of those present were from European countries where these ideas are still very much alive, if in a different form than was the case when monarchs were heads of government as much as heads of state. That lead me into further investigation of the Order and of the crusader orders in general which are, or claim to be, extant today. Order of St Lazarus of Jerusalem (1123). Some, like the Templars, were disbanded (giving us Friday the Thirteenth as an unlucky day). Others morphed into elaborate charitable organizations, continuing the work of hospitals or support of the Christians in the Holy Land, but abandoning the militaristic aspects after the conquest of Acre in the late thirteenth century. The Order of St. Lazarus survived in this transformed mode, and various attempts were made by popes to merge it with other Orders (Order of Our Lady of Bethlehem, the Order of Malta, the Order of St Maurice) throughout the fifteenth and sixteenth century. At the beginning of the seventeenth, the Order was effectively transferred from papal oversight to the royal house of France. It effectively ceased following the French Revolution, Royal Protection being withdrawn from the Order in 1830. Whether it continued then or in what form is apparently a matter of some dispute among historians of chivalrous orders, nobility, and the like. In 1910, though, the Melkite patriarch and some veterans of the papal army revived the Order as a non-profit charitable association under French law. Its efforts at ecumenical inclusion began in the 1960s, in fidelity to the reforms of the Second Vatican Council and in the interest of expanding into the anglophone world. Order of St. Lazarus – Jerusalem – Bishop Richard Gerard, emeritus Representative of the Archbishop of Canterbury to the Holy See. If you are interested, more extensive history of the order is provided here by the order itself, and here by a skeptical researcher. Nevertheless, the charitable work of the Order – mostly hospital and ambulance work – and its ecumenical inclusion are worthy of admiration. All such orders could, perhaps, divest themselves a bit of concerns over nobility and dynastic ties and promote based on merit alone. That being said in principle, my impression of Prince Sixte-Henri and his officers was positive, setting the standard for what one supposes nobility is supposed to represent in the first place. “Assisi alone is enough reason to beatify Pope John Paul II” was the headline of the Catholic Herald in the UK last April, a fortnight before the late pope was approved for veneration on the calendar of the diocese of Rome and in Poland as one of the “Blessed”. Karol Wojtyła became a pope of many firsts, and John Allen, Jr. has recently quipped that Joseph Ratzinger has become a pope of seconds – but that these second times can be as important as the first. In part, this is because it gives certain sustainability to an event or program, showing that it was not a personal proclivity of the past pope, doomed to die with him. This has been true of World Youth Day, and now of the Assisi pilgrimage for peace. The current bishop of Rome is a theologian, a teacher, and an introvert. He takes a few of these grand points, and is digging deeper, giving them ‘staying power’ in the system and with reflection. In the process, he is adding his own spin on things, too. Much ado was made of the fact that this time around, the fourth gathering of interreligious leaders to Assisi for the cause of peace, there would be no ‘common prayer’ so that not even the most rigorous of the right-wing could cry foul (or so it was thought). Never mind that there was never ‘common prayer’ in the first case, either. Coming together to pray is different than coming to pray together. In 1986, the day concluded with a series of prayers, each religious group leading its own prayer, while other participants looked on in respectful silence. It was close enough that even Ratzinger was reserved about the appropriateness at the time. 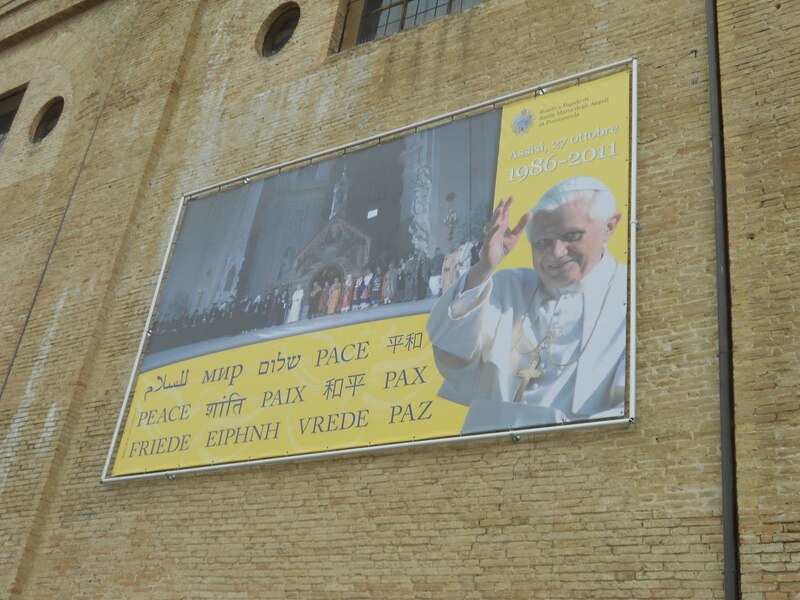 This year, the day started at the Basilica Santa Maria degli Angeli with a series of 10 scheduled talks on peace, after an introduction from Cardinal Turkson of the Pontifical Council for Justice and Peace, which organized this year’s event. The appeals were offered by four Christians, followed by five non-Christian religious leaders, and one ‘non-believer’. There was a confused moment as the apparent Muslim guest was brought to the lectern, refused the notes he was offered, and went on to explain in Arabic that he was not the person listed on the program, but offered a reflection anyway. Only after the last scheduled speaker was the original Muslim representative produced to deliver his address; I still do not know who the first Muslim presenter was or what else he said. Before the day, Fr. Tom had asked what language the day would be presented in. Based on my experiences in Rome for major liturgies and events, I indicated Italian, with only smatterings of others. I was wrong. Throughout the day, the three cardinals all spoke in English. In the morning, it was clear that efforts were made to be as universally understood as possible: English was used by the Anglican, WCC, Jewish, Muslim, Hindu, African animist religious representatives. French was spoken by the Orthodox and agnostic. The Buddhist representative spoke in Korean, and the unplanned Muslim speaker was in Arabic. In the afternoon, native languages were used, and worth noting that Arabic was not just “the Muslim language” but also that of the Syrian Orthodox and the Lutheran representatives. Instead of a series of prayers lead by different religious groups, this time the afternoon session in the lower piazza of the Basilica San Francesco included a series of solemn commitments to peace by assorted religious leaders. This was introduced by Cardinal Jean-Louis Tauran of the Pontifical Council for Interreligious Dialogue, and lead by the Ecumenical Patriarch, Bartholomew I. 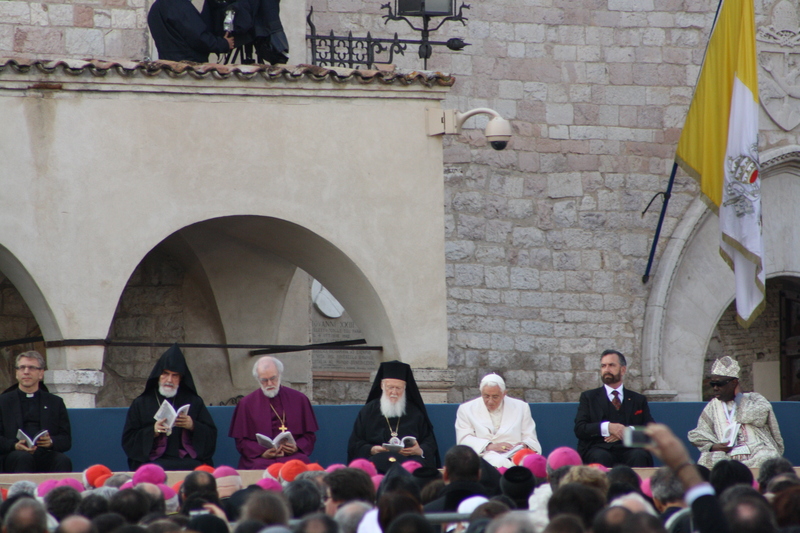 Ten religious leaders and another non-believer made their solemn commitments, followed by an address of Pope Benedict XVI, and closed with an invitation to exchange a sign of peace by Cardinal Kurt Koch of the Pontifical Council for Promoting Christian Unity (and the Pontifical Commission for Religious Relations with the Jews). There is no question that it was a beautiful day, and inspiring simply to bring all of these people together as a witness for peace, the positive contribution of people of faith to the world, and even of the potential to overcome the modern myth of a necessary animosity between “people of faith” and “people of science” – ie, secularity. Yet, there also is no question in my mind that something was lost with the over-emphasized intentional lack of prayer. How can a ‘pilgrimage’ be true to its nature without prayer? How can you gather religious leaders together, and tell them not to pray? This year, there were not even the sequestered opportunities for prayer that marked the last such event, in 2002, held in response to the terrorist attacks of 9/11, much less the series of prayers offered in public that marked the first event 25 years ago. There was a moment of silence in the afternoon session for everyone to “pray or commit their thoughts to peace” – on one hand, very hospitable for even those who do not pray. On the other, I think the type of prayer offered in 1986 lends itself less to accusations of syncretism (exaggerated in either case), where each tradition is allowed to be true to itself, rather than having a single, mixed, everybody-do-what-you-want moment or prayer and positive thoughts. Some of the speakers offered prayers spontaneously as part of their delivery, others quoted scriptures. For our own part, an unplanned opportunity presented itself. In what must be a first for a papal event, the closing ceremony actually finished half an hour early, and the restaurant we planned for a quick pizza before returning to Rome was not yet open. With half an hour to kill, our group split in various directions, some to shop, some to wander, some to pray. About ten of us wandered up to the 13th century Church of Santo Stefano, a beautifully simple church whose bells were said to have miraculously pealed at the moment of Francis’ death. As the Christians prayed in the front of the church, some of our Muslim pilgrims prepared for their own evening prayer, at the back of the church. As Christians finished, instead of walking out past the praying Muslims, most stopped and waited as respectful observers. It was just a few minutes, it was spontaneous, and it made the day a genuine pilgrimage of truth, for peace. With guests in town since Holy Thursday, we had done the liturgical marathon of the papal Triduum, including the Eucharistic adoration pilgrimage, and on Easter Monday set out for Florence. We stayed there a couple of nights, then to Assisi for a couple nights, and returned to Rome on Friday along with growing crowds of pilgrims and tourists: Little time to prepare for the next spiritual marathon, with the events surrounding the beatification of Pope John Paul II. And that is how I found out about American justice being served on the Sunday called Divine Mercy by the pope who was being beatified on that very day. I had not had time to check news or mail much in the last dozen days, and none at all in the last 48 hours. My first reaction was that the timing is interesting. As I said above, American justice served out on Divine Mercy Sunday; The coincidence of three news events, each treated in order of growing importance – the royal wedding, beatification, and killing of bin Laden all on one weekend; the fact that the day before, my guests (whose time in rome seems to have coincided exactly with the final stages of presidential preparation to go into the compound) and I having just had a conversation about how we have heard nothing from or about Osama bin Laden in months. Also interesting given that JPII and the Catholic Church were so clearly opposed to the second Iraq War, a point made during the Vigil on Saturday night. While some friends and classmates began to celebrate (there was applause in the Angelicum remember, and I know of a priest who publicly stated it was good to celebrate Osama’s death), I kept thinking that our CIA and SEALs did exactly what they are trained to do – and what they are deservedly respected for – executing with extreme prejudice. They served justice, but there was no room for mercy, whether that was the intended result or not (and until we hear otherwise, I assume that it was the intent to capture if possible – but the worry that it was not remains). “Osama Bin Laden, as is known, claimed responsibility for grave acts that spread division and hate among the peoples, manipulating religion to that end. A Christian never takes pleasure from the fact of a man’s death, but sees it as an opportunity to reflect on each person’s responsibility, before God and humanity, and to hope and commit oneself to seeing that no event become another occasion to disseminate hate but rather to foster peace”.